Now after creating the buttons, when you click on Run button in that GUI window, it will ask you to save this GUI file (with extension .fig), also known as ‘fig file’. As soon you saved the file, it will automatically create a code file (with extension .m), also known as ‘M file’ (see below screen shot), where you can put the Code (given in Code section below). You can download the GUI file and Code file for this project from here: Home_Automation_system.fig and Home_Automation_system.m (right click and select Save link as...), or you can create them yourself like we have explained. After coding you can now finally Run the .m file from the code window, you will see “Attempting connection..” in the command window. Then a “Arduino successfully connected” message appears, if everything goes well. And finally you will see previously created GUI (buttons) in GUI window, from where you can control the home appliances by just clicking on the buttons in your Computer. Make sure that Arduino is connected to Arduino via USB cable. Here in this project we have used 3 bulbs for demonstration, which indicates Fan, Light and TV. 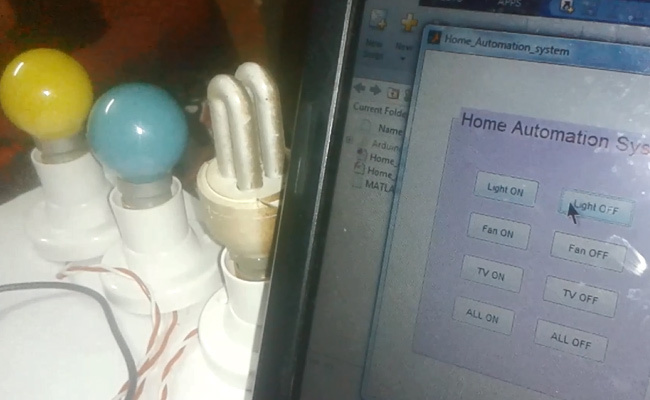 Working of the whole project, from installing the Arduino MATLAB support package to Turn On or OFF the appliance, can be understood at the Video at the end. Circuit of this project is very easy. Here we have used an Arduino UNO board and Relay Driver ULN2003 for driving relays. Three 5 volt SPDT Relays are connected to Arduino pin number 3, 4 and 5, through relay driver ULN2003, for controlling LIGHT, FAN and TV respectively. % function named CALLBACK in HOME_AUTOMATION_SYSTEM.M with the given input arguments. % stop. All inputs are passed to Home_Automation_system_OpeningFcn via varargin. % --- Executes just before Home_Automation_system is made visible. % --- Executes on button press in light_on. % --- Executes on button press in light_off. % --- Executes on button press in fan_on. % --- Executes on button press in fan_off. % --- Executes on button press in tv_on. % --- Executes on button press in tv_off. % --- Executes on button press in all_on. % --- Executes on button press in all_off. I have created a GUI of two push buttons and an edit box.When i click one of the buttons it would increments and the other would decrements..I need to connect these two buttons to two pushbuttons on Arduino, that is when I push the button of Arduino it would increment or decrement in GUI. Link to Download the GUI file (.fig) is already given in Working Explanation, with the name Home_Automation_system.fig. Right click on that link and Click on "Save link as..."
arduino object for this board. For troubleshooting, see Arduino Hardware Troubleshooting. I would like to know what do you mean by PVT in components required. PVT is terminal block with screw on relay module block. where did you guys used pvt? what is it mean and its significance? I can't run the Home_Automation_system.m code. Can I ask for a help??? board type. For more information, see arduino function reference page.